With the 2018 U.S. mid-term elections behind us, and newly-elected officials sworn into office, it's time for important copyright issues to take center stage. This is our moment to remind them of the vital role that copyright, free expression, creativity and innovation continue to play in our lives. There is no "left" or "right" when it comes to respecting copyright. The creative community stands united in support of a copyright system that has made — and continues to make — the United States the global leader in the creative arts and the global paradigm for free expression. Our copyright system is not perfect, but, like democracy, it is better than the alternatives. It works. Now more than ever, we urge candidates to universally resist attempts to erode the right of creators to determine when and how they share their works in the global marketplace. Our open letter garnered nearly 100K signatures preceding the 2018 mid-terms! Now, we need to show those we voted into office that we're still paying attention. Make your voice heard in support of creators by signing now. We are members of the creative community. While our political views are diverse, as creatives, there are core principles on which we can all agree. And we appreciate the opportunity to share our views with our country's leaders. We embrace the internet as a powerful democratizing force for our world and for creative industries. We recognize its ability to inspire positive change and improve lives. In our creative industries, the internet has helped to advance creativity by removing barriers to entry for newcomers, fostering a dialogue with fans and audiences, and providing numerous additional ways to reach them. The internet holds great potential to expand creativity and free expression. We embrace a strong copyright system that rewards creativity and promotes a healthy creative economy. The incredible cultural and economic value that the internet delivers to billions of users is based in very large part on the efforts of creative content makers whose livelihoods depend on being compensated for their efforts. Internet platforms are making massive profits from creative contributions to the internet's growth. It is not too much to ask that content creators should be able to share in the value they provide. We proudly assert that copyright promotes and protects free speech. Freedom of speech and freedom of expression go hand in hand with the freedom to create and to preserve the value and integrity of what one creates. The copyright clause of the Constitution is not in conflict with the First Amendment; indeed, the Supreme Court has called copyright the "engine of free expression" and copyright law has "built-in free speech safeguards." To creative people, self-expression is deeply personal. It is at the heart of everything creatives do. We view any effort to diminish the rights of creatives in the name of "free speech" as cynical and dishonest. Copyright should protect creatives from those who would use the internet to undermine creativity. The internet can be a great tool for creatives just as it can be a tool for science, education, health care, and many other disciplines. However, when misused, it can harm creativity and stifle freedom of expression. Our leaders must recognize that a safe and secure internet benefits us all. And all parties recognize the importance of strong copyright protections in their technology policy platforms because protecting copyright and internet freedom are both critically important and complementary—they are not mutually exclusive. A truly free internet, like any truly free community, is one where people respect the rights of others and can engage in legitimate activities safely—and where those who do not are held accountable under law by their peers. Creatives must be part of the conversation and stand up for creativity. Some organizations and advocates, who in many cases are funded by online platforms, repeatedly claim to be pro-creatives and pro-audience to mask their own self-serving agenda. They denigrate or block effective efforts to preserve and promote creative content, including enforcement of existing laws and voluntary industry initiatives. The creative community is rightfully wary of any company or organization that claims to be "against piracy" when their actions do not match their words. 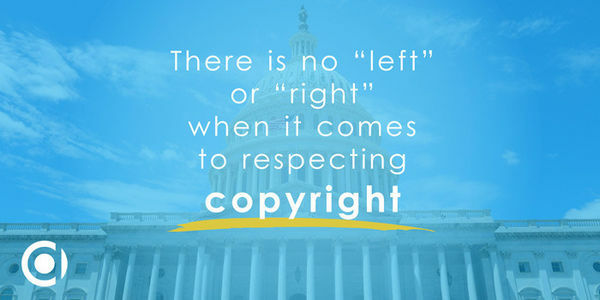 There is no "left" or "right" when it comes to respecting copyright. The creative community stands united in support of a copyright system that will continue to make the United States the global leader in the creative arts and the global paradigm for free expression. Our copyright system is not perfect but, like democracy, it is better than the alternatives. It works. We urge our leaders to uphold America's commitment to the rights of creatives to determine when and how their works are shared in the global marketplace.